IBM users can migrate their email data to Office 365 environment easily using this efficient Lotus Notes to Office 365 Migration. 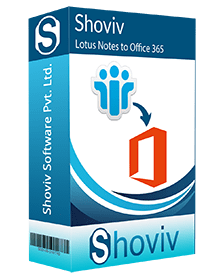 The software has the power to convert complete data to the office 365 environment without having any trouble to Lotus Notes users. 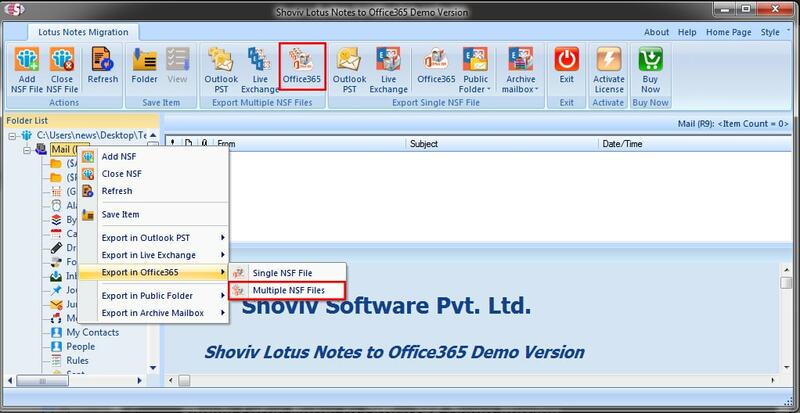 *Free Download allows to convert & save 25 items/folder from Lotus Notes to Office 365 Migration. 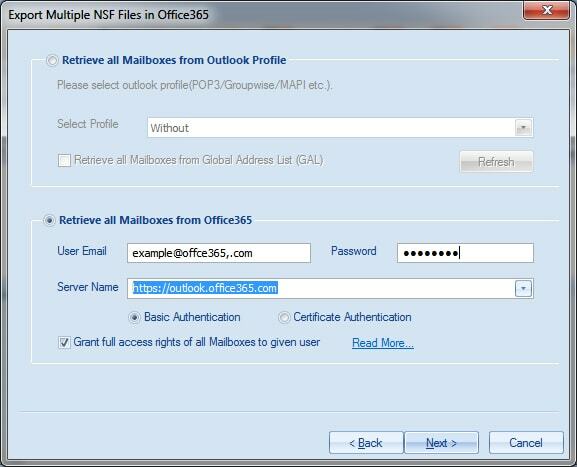 Lotus Notes to office 365 migration tool provides an easy operation to perform migration of Lotus Notes mailboxes into Office 365 mailboxes without having any interruption. 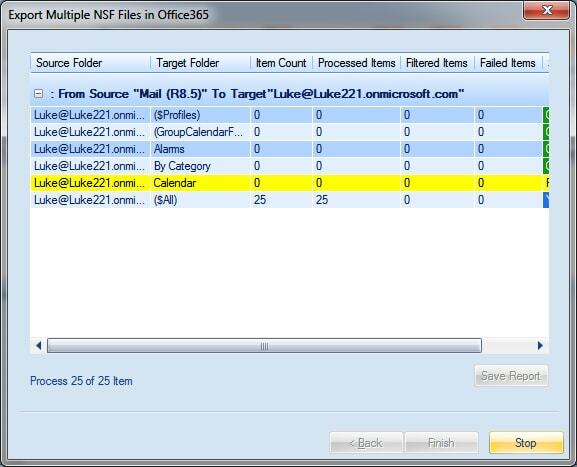 User can also set source and target mailbox for multiple user mailboxes using mailbox mapping option. The data of Lotus Notes can be migrated to multiple mailboxes of Live Exchange Server. One can manually map NSF files and Live exchange mailboxes whenever required. The data of NSF Files & Lotus Domino server mailboxes can be migrated to Multiple PST Files proficiently. In case you are carrying a large NSF mailbox, you can split resultant PST file into multiple PST files. Beside the migration from IBM Notes to Live exchange & Office 365, it is also capable to save all items to EML & MSG files without tampering any content. 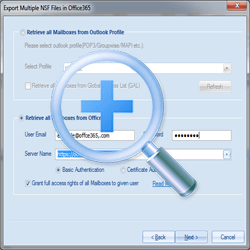 The tool has also featured with the option to access Lotus Notes items into MS Outlook & few other email clients on Windows, Mac machines as well. Users can select date-range filter the data while processing migration hob. It provides the options to migrate only selective items during the process. That being said, only those data will be migrated which the user wants. 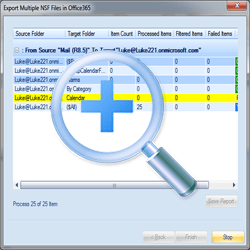 Folder mapping option allows the users to migrate items from one folder to another folder using folder mapping option. 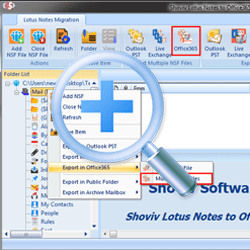 This feature is useful in the scenarios while migrating lotus notes <”Mailbox”> folder into outlook<”Inbox”> folder since, the name of <”Inbox”> folder in lotus notes called <"Mailbox"> folder. The tool provides filter option in order to migrate only selective range of data and migrate it prominently. The tool ensures zero-loss data prevention which helps to migrate Lotus Notes mailbox data to Office 365 without losing or tampering any content. It also provides the capability to migrate all data of NSF file to Office 365. This includes folders, contacts, sent items, email content, attachments, etc. One can see the entire progress report of Lotus Notes to Office 365 migration. 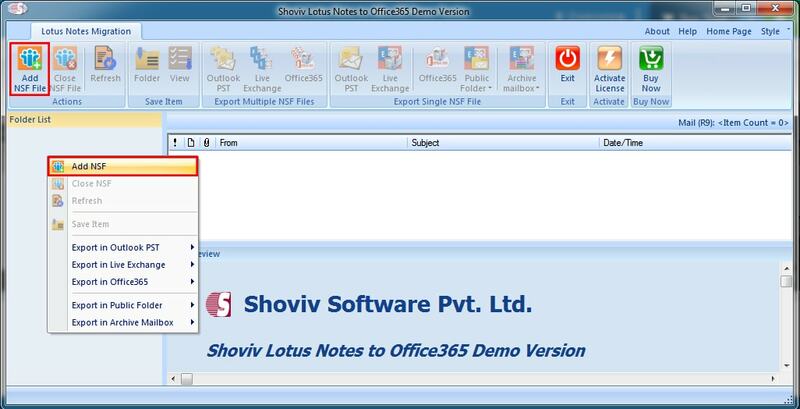 This report includesthe information about every items exported from Lotus Notes to Office 365. Which size of NSF file can be supported by the software? The Software support each and every size of NSF file, there is no limitation regarding the size of NSF file during the execution except. The file wouldn’t be damaged or corrupted anymore. Will I get the Folder hierarchy same as well, after the migration process? Indeed, you will get the folder hierarchy to remain the same after the migration process without any alteration, duplication in the format of your data too. However, you will get an option to change data formatting with the Lotus Notes to Office 365 Migration software. 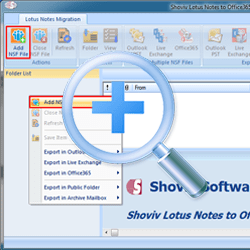 Which version of Lotus Note file is supportable to the software? Interestingly, the software supports all versions of Lotus Notes files which is available in the present time. Does the formatting of original file will also change if HTML formatting option is Enabled during data migration? Nothing will change in the original files, it will remain in the same format as it was earlier. Although HTML formatting option is enabled at the time of data migration. Is this software willing to migrate the data of damaged or corrupted NSF file? It gives you the facility to migrate only a healthy state NSF file. However, Shoviv also provides other software to target and settle your issue. Please check out our menu section.